We’ve now been at sea for nearly a week. 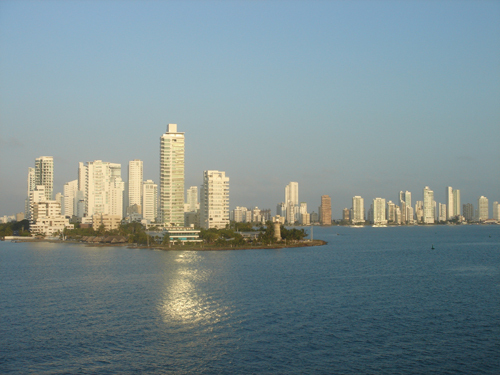 From Miami we took a southerly course past Cuba to Jamaica, then west to Cartagena, Columbia, spending a day in each. On the way, there were sightings of dolphins and flying fish, and the excitement of watching a pod of turtles swim by, the sun reflecting brightly off their heads and shells. 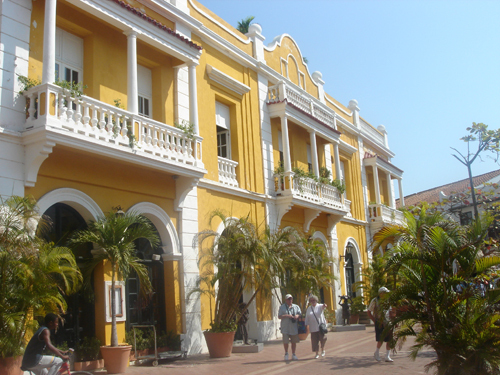 Cartagena is a smart modern city that is working hard, with apparent success, to overcome its bad reputation for drugs and crime. Education is held in high regard, with sessions of schooling in the morning and afternoon to accommodate all the children and also in the evening for older people who want to make up for what they missed when they were young. 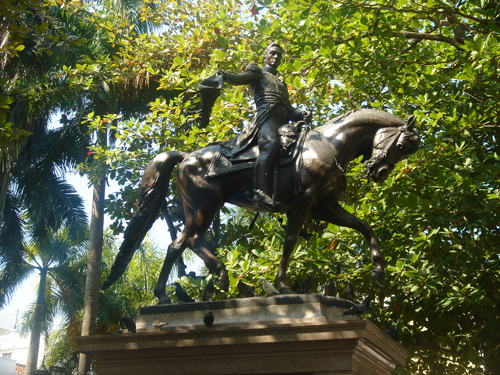 Simon Bolivar, who liberated Columbia in 1821, is the national hero and there is a statue of him in the old town, where much of the colonial architecture survives, and most of the old buildings have been well preserved. 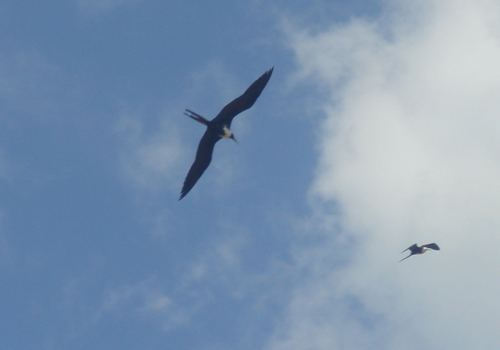 From there, accompanied by pelicans and frigate birds, we proceeded to the Panama Canal. We had looked forward eagerly to this day, and were certainly not disappointed. 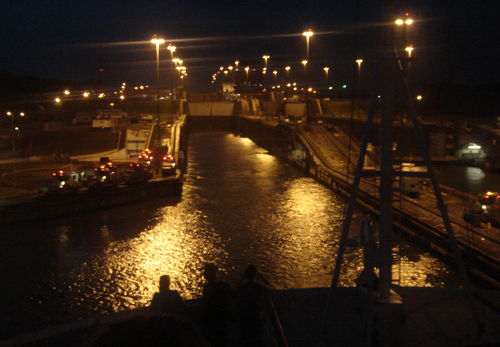 We rose at 5.30 to be up on deck as we approached the first lock and finally cleared Panama City on the Pacific side at about 4.30pm. I hope some of you were able to watch our progress and see a few of the views on the web camera. In case you haven’t discovered the webcam, for future reference there’s a link to the appropriate website at the top of this page. The Canal, finished in 1914, is a huge enterprise that must have transformed international shipping. Mechanical mules on the banks pull the ship through the locks, though when the new, larger locks are completed in a couple of years’ time, tugs will guide the ships through. It struck me that, apart from finance and politics, which were obviously involved in the endeavour, the project was the child of Vision, Engineering and Poetry. The Vision was perceiving the potential and believing that it could be realised. The Engineering was, in some ways, simple once the vision began to take effect – but took years of very hard work. 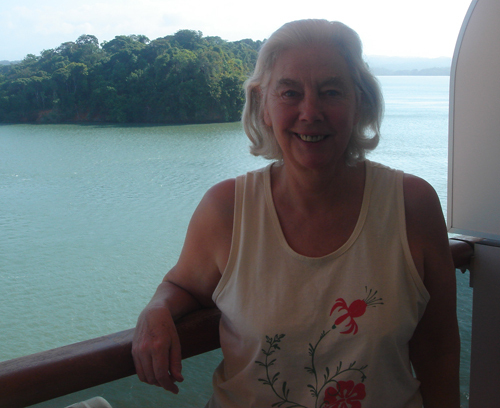 The Poetry is in the way it works so smoothly, and also in the sheer beauty of parts of the canal – particularly the Gatun Lake which stretches for many miles and is stunning. Not wanting to squeeze too much of a moral out of a highly enjoyable day, I could not help reflecting that for those of us who write, this trio of Vision, Engineering (including hard work) and poetry was familiar territory. 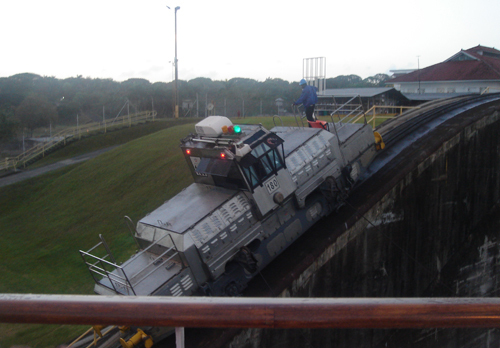 The locks, of course, depend on Lake Gatun’s immense body of fresh water to replenish the supply as water is locked down to the sea. As the rainy season can bring nine feet of water, the system is sustainable as long as climate change doesn’t alter the rain pattern too much. Presumably most of this beautiful lake was formerly rain forest, and the peaks of the hills are now exotic islands, deserted except for the one that houses a Smithsonian biodiversity research station. As we passed through the canal it was fun to have a huge crocodile to add to our list of wildlife. It must have been at least 14 feet long, and was lazing at the waterside just feet from the boat as we passed. I wouldn’t have been quite so pleased if I’d been walking. So, passing from NE to SW, we traced the magnificent connection between the Atlantic and Pacific Oceans. As we travel we also connect, fleetingly, with those we pass on the shore or in other boats. We receive enthusiastic waves from people on balconies, workers on the undersides of bridges, passengers in other cruise liners or in passing speedboats. reaching out to connect to those of you at home through this blog. It was a bit touch and go whether we would get out of Heathrow on Sunday morning, as so many flights were cancelled because of the snow; but we were fortunate enough to take off only a little over half an hour late. First the plane had to be de-iced: I imagined that we would taxi through some giant warm warehouse rather like the railway sheds we went through when the train bogies had to be changed as we passed from Mongolia to China on the trans-Siberian railway many years ago; but in fact two lorries with cranes on top came to attend to us, dowsing us with appropriate liquids from long arms. They looked like maternal animals gently stroking us in preparation for flight. 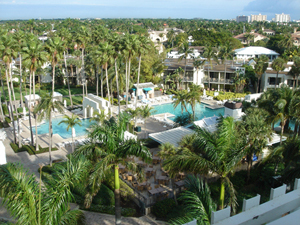 We left Heathrow in minus 1 degrees, and arrived in Miami to enjoy a very pleasant plus 27 degrees. We spent the night in an excellent hotel. I dislike smart pretentious hotels, but this one somehow managed not to be a all pretentious – though we were somewhat surprised to be put into an executive suite with two double beds. The next morning we did a tour of inspection of the boats in the harbour (always essential as one member of the family is a member of the Harbour Board! ), then had a long leisurely swim to cool down a little. It was a change to be seeing lizards, dragonflies and parakeets instead of our friendly robin and blackbird who have been grateful for our bird table recently. I hope someone else is looking after them now. The US is a country of dizzying contrasts. At Miami airport a long floral wall display assuring us that ‘All you need is love” welcomed us to the country that prefers to put an armed guard in every school rather than to ban the lethal weapons. Then, although the population is multicoloured, the society appears to be astonishingly stratified, with blacks and latinos doing the work while whites enjoy the party; yet the US has now twice pulled off the miracle of electing a black president. Barack Obama started his second term the day we arrived, and was sworn in the next day which happened, by happy coincidence, to be Martin Luther King Day. Having flown four and a half thousand miles at around 500 mph to get here, we are now chugging along happily at about 25 knots. I’ve often wondered about the word ‘knots’ for speeds over water, and I’ve now discovered that it comes from the days when a rope attached to a log was knotted at intervals of 47 feet 3 inches and paid out over the stern of a boat. The number of knots that ran out while a 28 second sand-glass emptied itself gave the speed of the ship in nautical miles per hour. As with most knowledge, however, that fact leads to more questions, such as ‘why 47 feet 3 inches between knots?’ and ‘why 28 seconds?’ Discussing this at breakfast, Hugh reckoned that the 28 seconds was to measure a half minute, allowing for turning the sandglass over, and the 47 feet 3 inches is probably the same fraction of a nautical mile as 28 seconds is of an hour. Does anyone know if this is correct? Anyway, just in case you didn’t know, a knot equals 1.15 mph over land. It’s quite difficult doing this blog on a very slow connection. However, I was told firmly that I had to include photos of us, so here we are setting sail yesterday. Next stop Montego Bay, Jamacia. 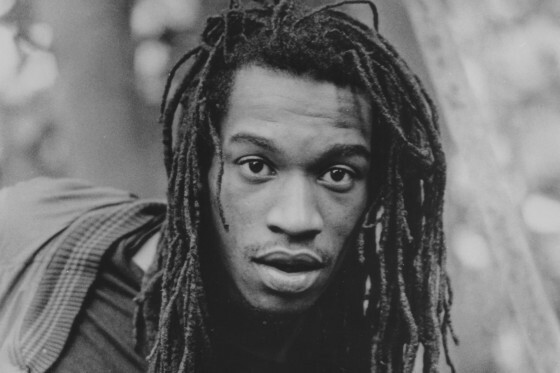 I discovered that Benjamin Zephaniah was guest editor on the Today programme, and he was discussing the relative merits of good and bad news with the arch-cynic, John Humphrys. Benjamin was urging the radio presenter to report more good news, instead of giving us an undiluted diet of bad news. In the interview, Humphrys claimed that no one finds good news interesting, which is patently not true. He gave the example of ten aircraft setting out from LHR to the US, and all ten arriving safely. ‘There’ he declared triumphantly, ‘no one will be interested unless one of them crashes.’ What he failed to understand, of course, was that the item wasn’t news because it wasn’t new. Its lack of newsworthiness had nothing to do with whether it was a catastrophe or not; it failed to be news simply because there was nothing new about it. A similar number of aircraft make that journey every day. Another example Humphrys put forward to support his view that good news isn’t worth reporting was of a powerful earthquake in which there was no loss of life. As the earthquake was new, this did constitute news – good news; and it’s possible that most people would be more interested in an earthquake that didn’t kill people than in one that caused massive casualties. A third story with which Humphrys taunted Zephaniah was of an elderly couple who were sharing their 100th birthday, and who had been married for something like 72 years. Fantastic. That really should be on the news: it’s happy, unusual and encouraging. Cynicism and depression are self-perpetuating, so we need to share some of the good things that happen in the world instead. I’ve just received an email from someone who was in Rome for the Taizé meeting of young adults over the New Year. The fact that 40,000 young people from many different traditions made the journey and spent several days talking and praying together somehow didn’t make it onto the radar of journalists who are always so quick to report the many failings and scandals of the Church and the waywardness of the young. 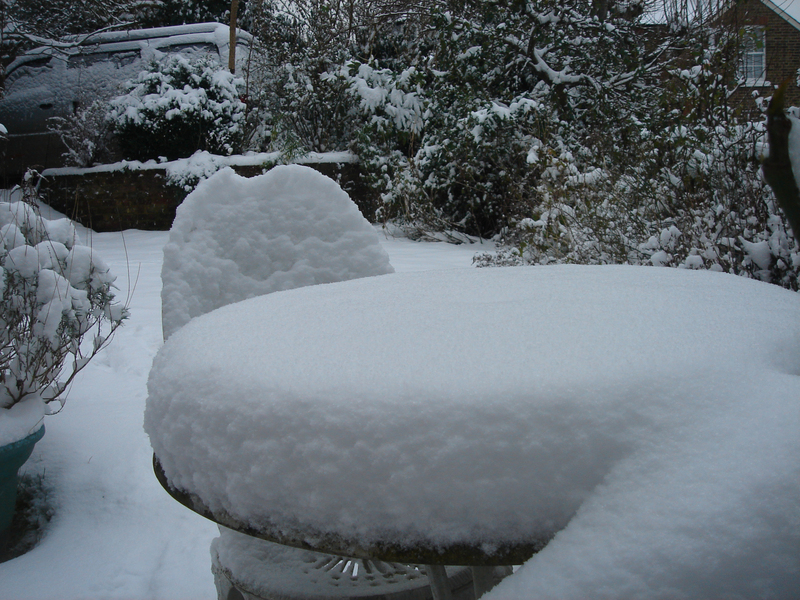 There’s an old expression sometimes bandied around by writers to the effect that ‘Happiness writes white’. In other words, great writing is more likely to come out of an unhappy state of mind than a happy one. I can never decide whether this is true or not, especially as I have personally produced decent work both when I’ve been heart-broken and when I’ve been euphoric. Zephaniah’s poetry encompasses the good and the bad, anger and celebration, and I think that’s the sort of diet that reflects the real world in which most of us live. There are also exceptions to the misery-mongering of the media. For example, there’s a newspaper called Positive News, which one can sometimes pick up in whacky places like Dartington, which redresses the imbalance in the rest of the media by reporting on good things that have happened. Two young women have, tragically, been in the news recently: Malala Yousafzai and Jyoti Singh Pandey. 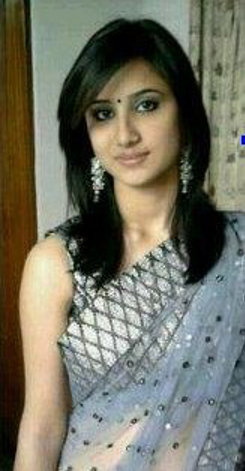 Sadly, the young Indian medical student will slip into the mire of crime history and be forgotten by most of us within a few months – though not by those who loved her. 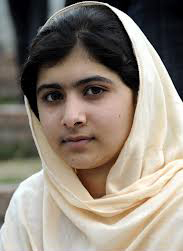 Malala is ongoing news and we’ll continue to watch her with interest. Let’s hope that journalists, too, will continue to find her interesting as she returns to full health and continues with her courageous campaigning. But underlying both these appalling cases is a sub-text of gender inequality. We have achieved so much in the last century, but these stories remind us that there is still a long way to go before everyone accepts that girls have as much right to education as boys do, and that attractive young women are people of dignity and worth, whose bodies belong to themselves and no one else. If and when that equality and dignity are accepted as normal everywhere, that will certainly be good news worth sharing. and puppy-like joyfully welcomes friend and foe. Happy new year. My next blog (good news) will be from far across the sea. Until ten years ago I’d never spent Christmas in the country, so the last ten Christmases have been full of new delights. Looking ahead to this one, it didn’t cross our minds that it might be the wettest Christmas on record; but fortunately the crazy weather didn’t spoil our enjoyment. 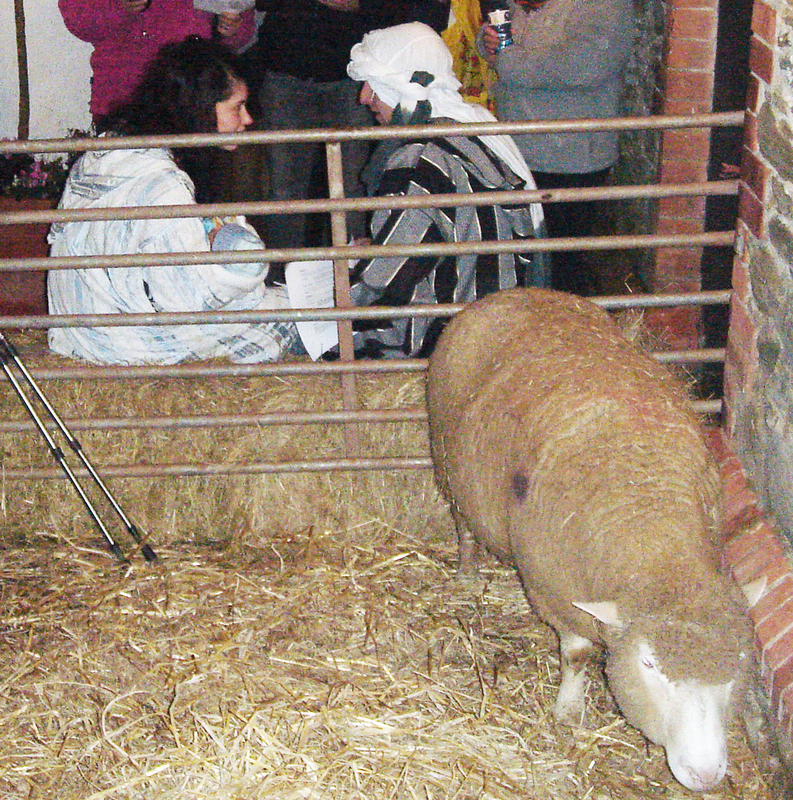 I thought I’d share some of the many delights and maybe even the few drawbacks of a village Christmas. 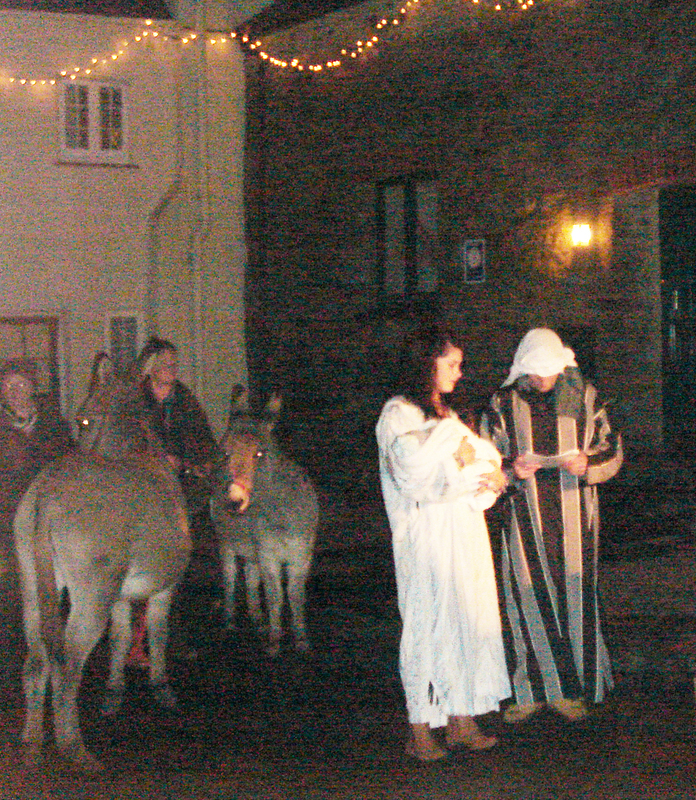 There had been several festive gatherings in the last few weeks, and a traditional Christmas Carol Service was held in the church on Sunday 16th December, but the celebrations began in earnest on Thursday 20th, when our local pub staged their version of the Nativity play for the sixth year running. This year we had not only two donkeys and a sheep with its new-born lamb, but also a three-week-old baby to play the part of Jesus. 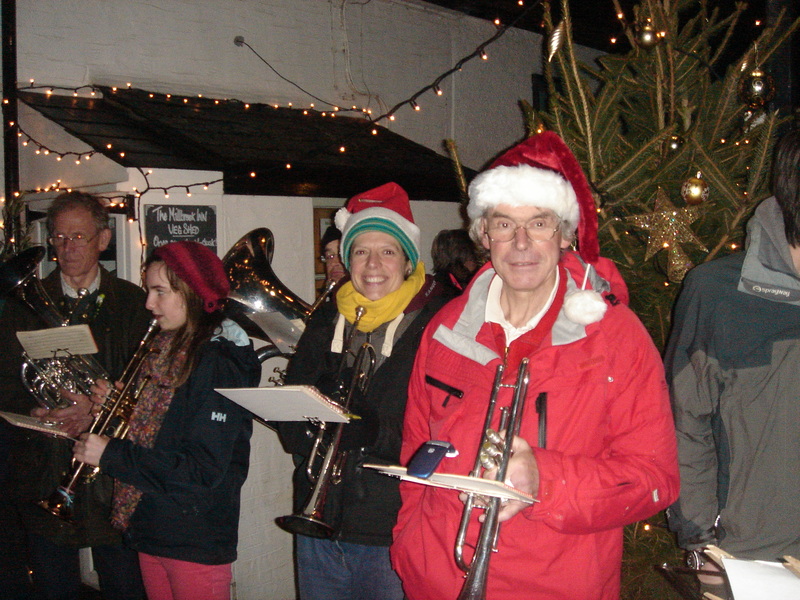 and the whole experience was further enhanced by the presence of the local Silver Band, which made sure that we all sang the carols with appropriate gusto. After a very enjoyable evening, some of us moved on to the pub in the next village, to join in one of their regular folk nights. A couple of dozen local people meet here every fortnight to play and sing to each other in an extremely relaxed atmosphere, and the instruments on this particular evening included a dulcimer, several accordions, guitars and bodhrans (hand drums), and a couple of violins. Among the singers was a group of burly men called the Gaffers who sing a range of unaccompanied songs with enthusiasm, harmony and humour. Rather than celebrating with Midnight Mass at the village church, we had a Christmas Eve service of Communion by Extension at 10.00pm. This is, of course, a direct result of the fact that our church is one of nine churches in what is known as a Joint Benefice. The fact that we have one priest for all nine churches is one of the disadvantages of living in a rural area, and it does, unfortunately, mean that going to church can sometimes be a rather less than satisfactory experience. Those who live in the country have the same needs, hopes, aspirations and spiritual hungers as those who live in larger centres of population, so it saddens me when they are offered only a meagre diet of religion. 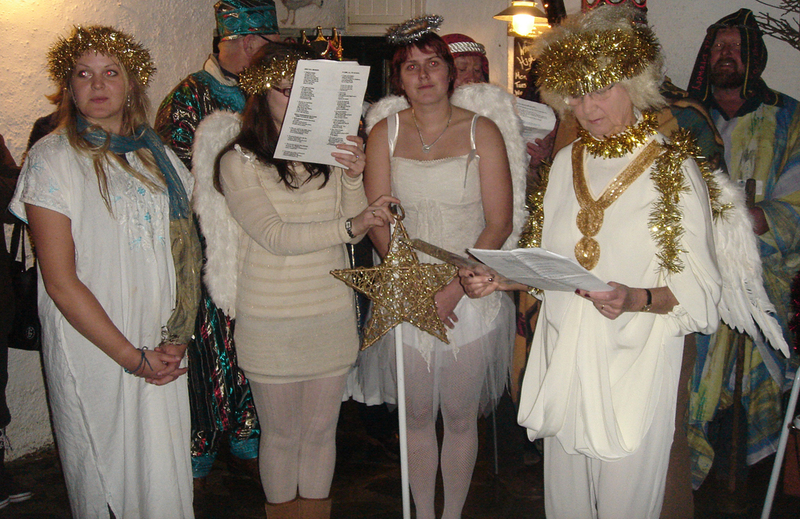 After the service, we moved down to the pub to sing more carols and wish each other a happy Christmas. As midnight struck, many of us were still sitting outside, enjoying and marvelling at the unexpected warmth. 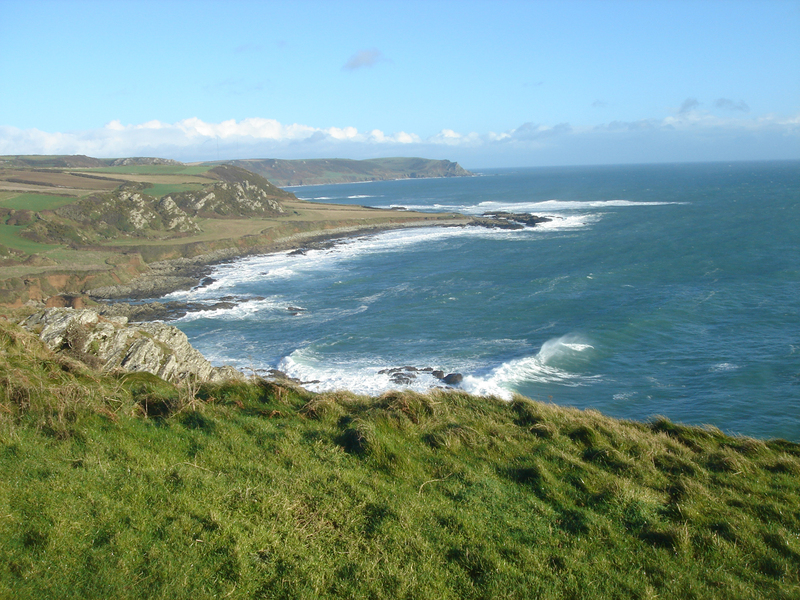 As well as all the music, many of us spend a considerable amount of time out walking, and despite the weather forecasts, we managed to stay dry most of the time and even had some lovely warm spells of sunshine. 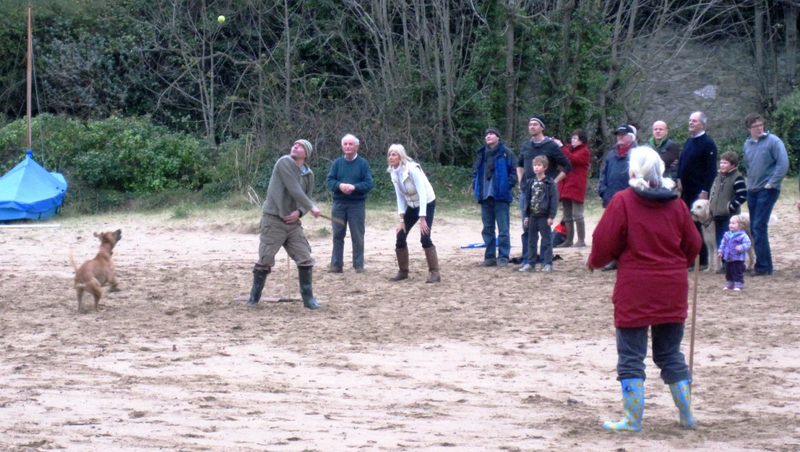 Another highlight of the village calendar is the Rounders Match on Boxing Day, when crowds of us from the village, plus friends and visitors, gather on the beach for an energetic game in which the men’s and women’s teams fight it out for the most rounders. In the last ten years we have had snow and ice such that we had difficulty banging the posts into the sand, and sunshine warm enough to force us to strip down to our tee shirts, but we had never been rained off before. We were a little indignant, therefore, when the rain began just as we parked the car, and by the time we were on the beach it was in extreme wetting mode. 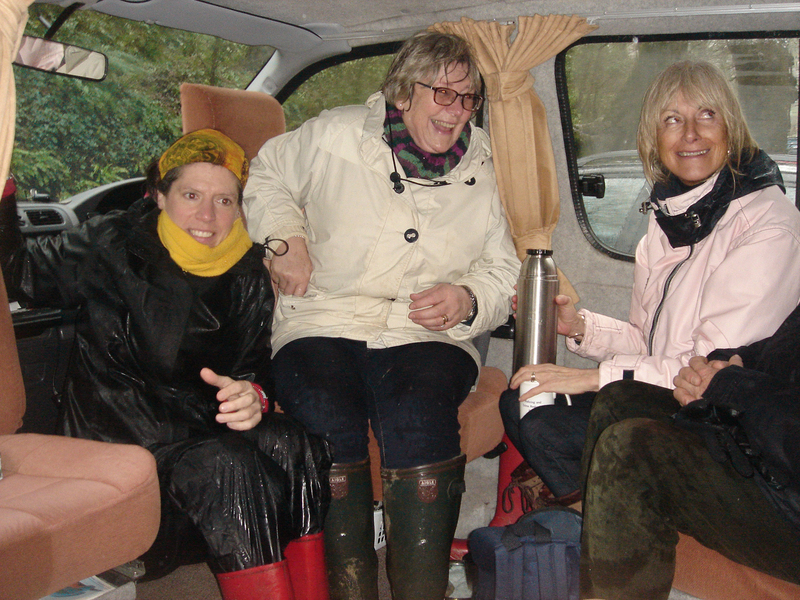 We therefore retreated to the car park, and seven of us squeezed into our camper van to enjoy mulled wine, mince pies, talk and laughter. I include here a picture from last year to show what it is normally like, and one to show how we dealt with the conditions this year. 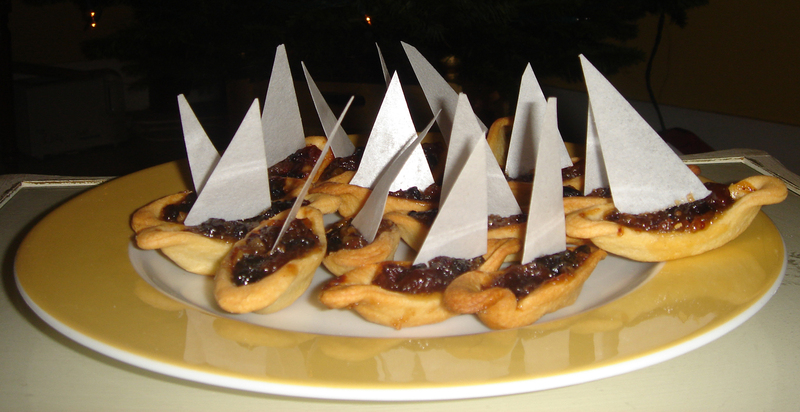 If I don’t write poetry for a few days, the creative urge tends to squeeze out in other ways, including the culinary; so when the time came to make some mince pies, I found a Christmas regatta emerging from my oven. So what are the positive and negative aspects of spending Christmas in a small English village in the 21st century? I’ve already mentioned the limitation of being part of a church that doesn’t feel it necessary to invest in small rural communities. This will not be of concern to non-church-goers; but for those of us for whom Christmas is first and foremost a religious festival, it is quite a disadvantage. As in other communities, people in a village sometimes fall out with each other: but unlike in larger centres of population, they generally find that they have to get over it quite quickly and give a high priority to living in harmony with their neighbours; so that turns out, after all, to be more positive than negative. The other positive aspects of our village Christmas are almost too numerous to mention. I’ve given some indication of the range of activities that take place in the village, and they are all community-based rather than being organised from above. That doesn’t mean that they don’t involve effort and commitment, but those characteristics are not in short supply here. We know the shop keepers and the postman, and it is warming to arrive home to find a little note from the postman telling us where he’s left a parcel, and who it is to. On top of all this, we live completely surrounded by the beauty and splendour of the natural world at its richest and most varied. Nature has shown its force again this Christmas, so several homes have been flooded and landslides have broken a number of our banks. But we know that every time we leave the house we will breathe clean air, feel the elements on our faces, meet wildlife and see beauty. This week we have met a seal down near the beach, watched a wide range of birds, caught sight of a vole, been almost deafened by the crashing of waves, and sat on the sand soaking up the welcome sunshine. 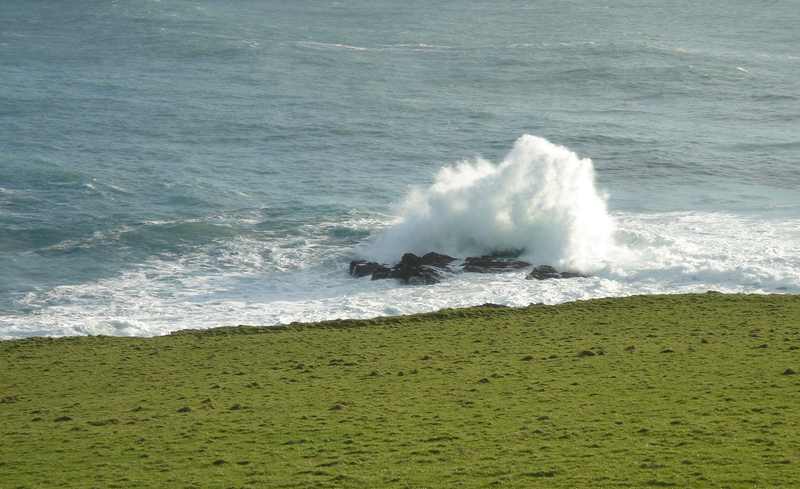 So I end with two pictures from our Christmas Day walk, and wish you all the very best for 2013. We’ll have to start preparing for our long sea voyage in a couple of weeks’ time, but for a few more days we’ll be enjoying life in our lovely village. I enjoy sending and receiving Christmas cards, and can cope with quite a wide variety of tastes in the ones I receive. I particularly enjoy the home-made ones, and some people clearly put a great deal of effort and skill into producing their own cards. I also appreciate receiving news from old friends from whom I hear only once a year, in those much-derided Christmas letters. However, many years ago I found I couldn’t find any cards to send that actually expressed what I wanted to say about Christmas. I love the visual arts, but found that all the beautiful pictures of the nativity, the sages from the east, the shepherds and angels, didn’t actually express the deeper truth of incarnation for me. They decorated or embellished the Christmas story, rather than going to the heart of it. The one exception to this is portrayals of the Annunciation, because in those it often seems as though the artist is struggling to express the inexpressible – a task familiar to the poet. Hugh and I therefore started to design our own cards. Some of these used words, such as short biblical texts or, more usually, a few lines from one of the great poets. In this one we chose some of the beautiful words from John Donne’s sonnet, Annunciation. As you can see, the Annunciation theme resonates with me in both the visual and the literary arts. Others leapt out into symbolism that I found meaningful, but which I know puzzled some of our friends and family members. My own very favourite one, in particular, was simply a beautiful gold circle which expressed my thoughts about God perfectly. I’m afraid to report, however, that on that occasion my mother thought we’d taken leave of our senses. Unfortunately we don’t seem to have saved one of these cards in our rough and ready filing system, but I’m sure you can picture it. This one extended that idea into an image of humanity and divinity meeting in the incarnation. Gradually it became clear that if I wanted a Christmas card to express something significant to me, I had to write a poem that actually said what I wanted it to say. So the tradition of writing a poem each year for our Christmas card began. 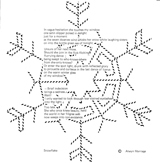 This early one, Snowflake, was set painstakingly using lettraset. The poem was written years ago, but still seems to be popular. Years passed, and the number of Christmas or winter poems increased. Some were serious and reflective, others were light and humorous. There have been several Christmas trees and snowy offerings, reflections on the nativity, including talking animals gathered around the manger and even, following the great Christmas Day Bible reading, one entitled Logos. A couple of years ago we used a poem of mine called Soft as a feather falling. I wanted a line of white feathers to go down the side of the card, so we set off on a wild goose chase to find a source of feathers. Eventually we discovered a friendly duck farmer who was only too pleased to give us bagfuls of white feathers. As we didn’t want to risk spreading avian ‘flu around the country, we microwaved them before sticking the onto the cards. This worked well, except that it made the kitchen rather smelly for a few hours. 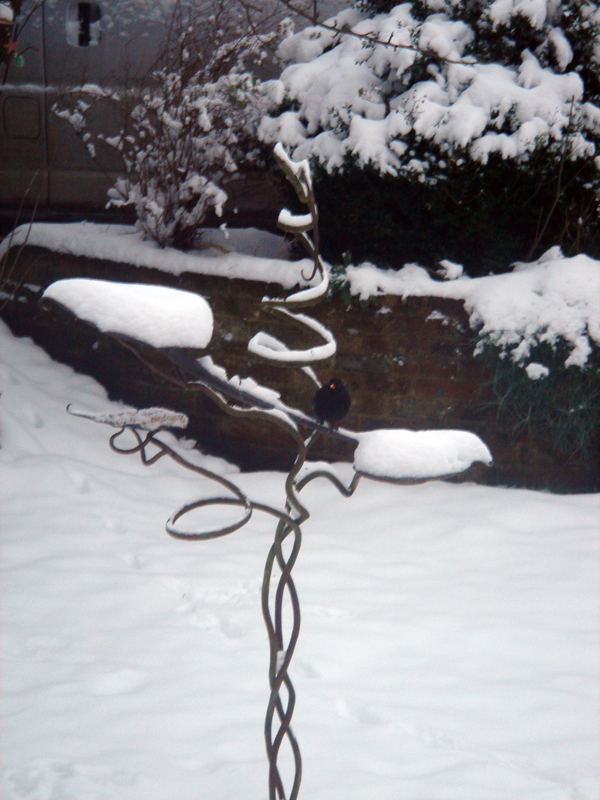 When Anne Born, who was Managing Editor of Oversteps Books, invited me to submit a poetry collection in 2007, I included a couple of my Christmas poems (Touching Earth). Anne later suggested that I should put a collection of these specific poems together in a separate collection. That was put on the back burner when Anne became ill and persuaded me to take over the management of Oversteps from her. This year I decided to follow Anne’s suggestion, and festo was published a few months ago. The past few months have consequently seen a fairly hectic schedule of poetry readings, and it’s been great to include quite a number of poems from the new book as I’ve travelled the length and breadth of the country. Plenty of these other poems are included in festo. haven’t been used as cards. About half of our Christmas cards are now being sent by email. This is something of a green initiative in terms of saving paper and ink, but also ensures that the cards arrive quickly, and it allows us to include links to web pages and blogs. If it really is the poem that people enjoy, rather than grappling with the problem of where to hang their Christmas cards, then presumably this will be welcomed. If anyone who has received an e-version this year would prefer a paper copy next year, please let us know. Then, of course, I had to sit down and write a new poem for this year’s card. 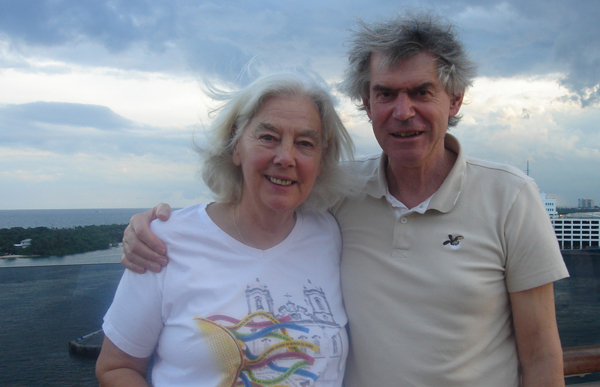 I return from New Zealand in early March, I thought I’d introduce you to the two poets. be near to her daughters. are obvious in this her first collection. with their wayward husbands’ bodies. like balm on the pain of the world. Simon Williams lives on Dartmoor where, as well as working as a technology writer, he runs the popular poetry, music and story-telling evenings at the Tradesman’s Arms. I can sympathise with him, I really can. so their eyes glint up in the headlights. the way they go bump on the bonnet, in flight. of bold robbers, who stop you for spite. as I come from a place where odd animals stand. This blog will include both information about and samples of my own writing, and news about my work as Managing Editor of the poetry publishing house, Oversteps Books Ltd. In the more immediate future it will take the reader with me on a long sea journey to New Zealand, where I’ll be appearing at various poetry events in February 2013.